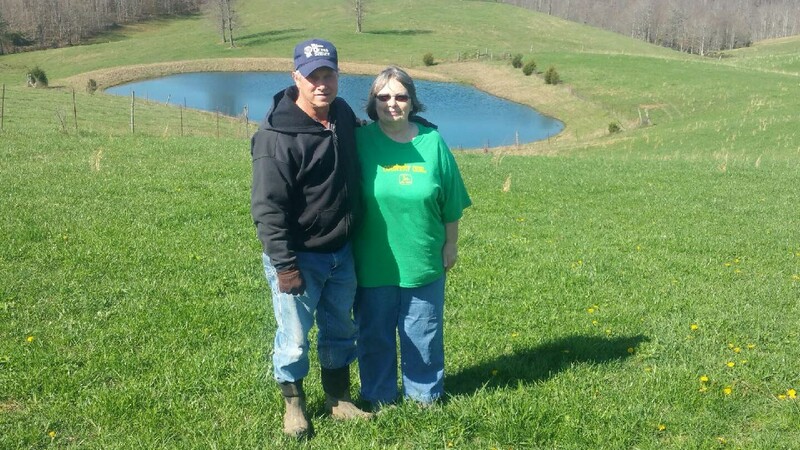 Every farmer realizes that no matter what, water is essential to producing any crop and livestock are no exception, especially to Ronnie and Brenda Purnell’s 270 acre farm in Carter County that steadily run 80 head of cattle. The Purnells needed to establish ample, clean water supplies for their cattle, and this goal led them to request assistance from the Carter County Conservation District through the state and local cost share programs to help them with the installation of several reliable watering systems throughout their fields. The Kentucky Soil Erosion & Water Quality Cost Share Program had just been established in 1994 by the Kentucky General Assembly authorizing the Soil and Water Conservation Commission to promulgate administrative regulations governing administration of the Kentucky Soil Erosion and Water Quality Cost-Share Fund and is administered by the 121 local conservation districts. The program provides cost-share assistance to people engaged in agricultural and silvicultural production for implementation of Best Management Practices (BMP), or structural, vegetative or managerial practices used to treat, prevent or reduce water pollution. The main purpose of these programs are to provide cleaner water through the reduction in animal waste, sediment, nutrients and pesticides in Kentucky streams, rivers and lakes. It also reduces the loss of topsoil vital to the sustained production of food, fiber and prevents surface water and groundwater pollution problems. Since the inception of the program, $138. 8 million dollars have been applied to lands across the Commonwealth. Today, this program continues to be a valuable resource that agriculture and silviculture operations rely on to aid them in complying with state and federal regulations. The Purnell’s cow and calf operation is prime example of just what the program was established for. Administered through their local Conservation district office with technical guidance provided through a partnership with USDA’s Natural Resources Conservation Service, their farm, like many across the bluegrass, has relied on the Kentucky state cost share program to help them follow and implement their agricultural water quality plans, which in turn, incorporate BMPs into their operations to protect their water resources from animal waste, nutrients and reduce the loss of topsoil. During a recent visit to the Purnell Farm it’s obvious that the state cost share program has helped them with their operation and protect the environment tremendously, and Purnell himself will be the first to tell you so. “If it were not for the state cost share program, I most likely could not have installed all these practices myself that have helped me operate to the extent that I am now that have protected the resources on my farm,” said Ronnie Purnell. The Purnell’s Farm and their animal waste storage facility built in 1998. As their operation grew, the Purnells needed additional water sources and the small pond Ronnie Purnell had built was not meeting their needs. So, without hesitation, Ronnie Purnell again sought the guidance and assistance of the state cost share program and developed a spring where the inadequate pond once was. In 2015 and 2016, the Purnells were awarded state cost share program funds for seed renovation practices to improve their hay and pasture fields to incorporate legumes into their already established grass fields. The clover seeding has already established itself and are helping the Purnells with improved forage for their livestock, but another aspect they say they didn’t realize until now, was that adding the legumes to their grass fields produced nitrogen which their other grasses use and in turn reduced the cost spent on commercial fertilizers. Next, the Conservation District will be offering to Carter County landowners, including the Purnells, free soil and manure testing. Ronnie Purnell plans on applying to have both his soil and manure analyzed so he will know the exact amount of additional fertilizer he would need to purchase in the future. The Purnells have done a lot of grass plantings and many environmental improvements on their farm at their own cost, but they doesn’t hesitate to contact the district office for guidance or to take advantage of program availability. An established field in foreground, in background a field that the Purnells are seeding on their own. For a complete listing of your local conservation districts office contact information, visit the Division of Conservation website at http://conservation.ky.gov/Pages/ConservationDistricts.aspx and find your local office for more information specific to your area.